BinMi - the Cashmerette dress looks great! Stephanie - I would also go for the first dress - great design lines, and you got just the perfect figure for that kind of pattern! I did finish my dress today. The only thing left to do for tonight is sewing the buttons on, then I can wear it to my sewing group meeting tomorrow. I used a medium weight grey wool crepe - I love to work with wool crepe! It is not lined, as the wool is not scratchy at all. I used this pattern and muslined it per Peggy instructions. There's a nice webcast about the dress, that explains a lot (eg. the dress needs to be snug at the waist for it to wear well, but the pattern runs intentionally big there, so it can be fitted to almost everyone - rather err on the big side) about the fitting. The muslin went together well, the fitting was done, and then I spend some time around the house in my muslin. It is a wrap dress, that closes at the waist, as wrap dresses do. And the fit and look is great when standing. But I did not feel comfortable AT ALL sitting down in it. There is enough overlap for the dress not to split open in the middle as such, but somehow I fear when sitting and 'recrossing' legs, moving around on the chair, lounging on the sofa, it MIGHT split open... I don't want to sew/wear clothes in which I have to be aware of my movements.... Nevertheless, I do like the dress, so I decided to 'undo' the wrap and make a shirt dress from it. 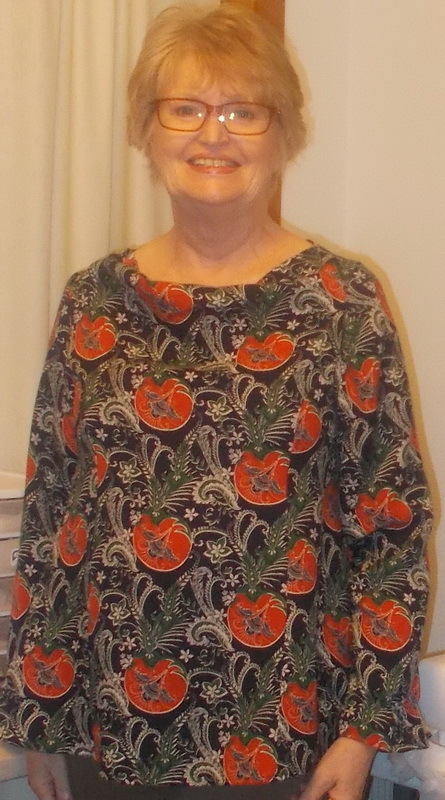 I cut the wrap part off (Center front is marked on the pattern) and sewed a long henley. For buttons I chose 5 odd buttons I found in my 'button box' - they are all silver, all 1,5cm and I thought it is a good oportunity to use them! One has a pearl coloured center, one shows St.Georg the dragon slayer. 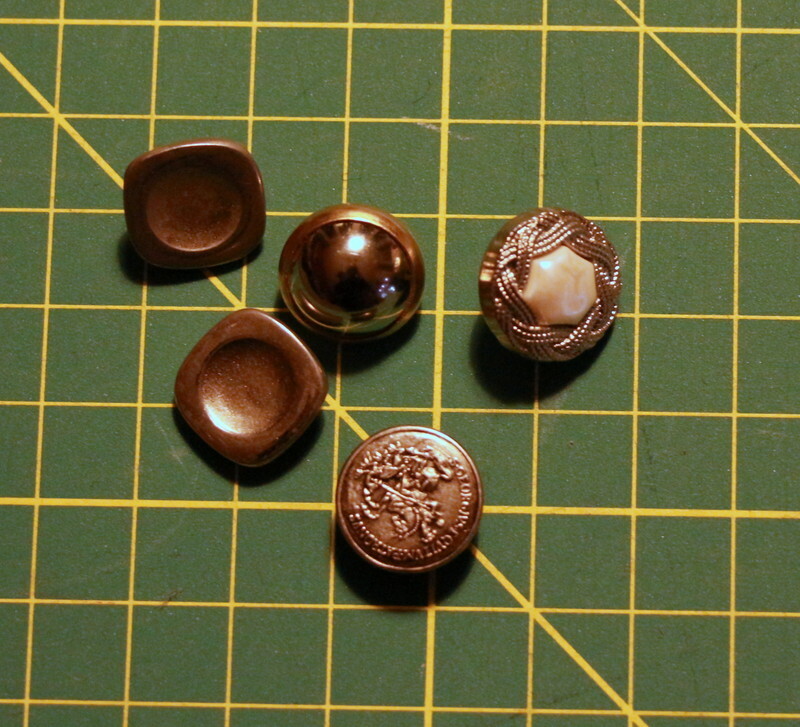 My daughter and her friend gave me advice in which order to sew them on - they decided for the button with the pearl center to be the upmost. So this will be the pearl dress! So, when I got a photo of the finished dress on me, where to show it? Here? In the gallery? Morzel: Your dress sounds wonderful! The buttons are very cool. I wore wrap dresses for a short period in my life, but I always felt very self-conscious about the bust part and I never liked the look of pinning or tacking the wrap down. So I retired my wraps and started wearing higher-necked things. 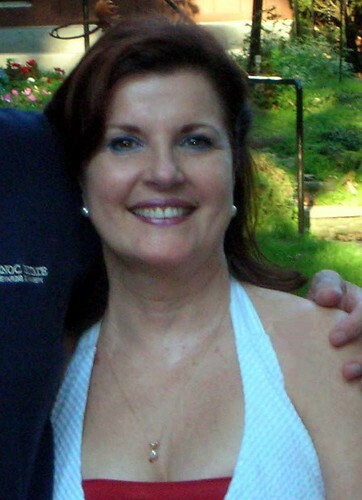 Several times in my life I have tried to wear wrap tops and dresses. They never stay closed on barely B-cup me and to my embarrasement, I was always flashing somebody. I hated the look of pinning or snaps. The only "wrap" that works for me is a faux-wrap. I do admire those who can wear a wrap top. It is just not for me. Actually, the wrap part above the waist stayed closed with this pattern - it is well drafted in that respect. So it could work as a top, I guess. Well my test wasn't exactly a success. I could have just a fabric failure on my hands in which case I need to make another wearable muslin. Then again, maybe the cowl is not drafted well and I need to start on a whole new pattern..
Oh Bev... I hope it's not a complete loss... that fabric is so bright and cheery. It is neatly folded and in the donate box. Needs more ease than can be recovered from the seam allowances and there is not enough fabric left over for a fix. Bev, as I recall, crepe can be subject to serial shrinkage unless it is vigorously pre-shrunk in a full wash/dry cycle or at the dry cleaners. It can shrink a full size with subsequent washings. Sounds like that's what happened to you. To my knowledge, viscose (rayon) is a natural fiber, made from wood pulp, which is why I enjoy sewing with it; it breathes and drapes nicely. But some rayon really likes to shrink and wrinkle. My favorite rayon is cuprammonium rayon which does not shrink or wrinkle (although I always pretreat it) and feels like silk. At the time I was hoarding it, it was made in Switzerland or Germany. I think I still have a piece or two left in my fabric emporium. I wash all fabrics except wool when they come in the door. They dont go any where near my stash until they ve been tortured a little and usually pressed. Denim gets the coke wash on 'sanitary' a setting that runs 2 hours and keepa the water heated high enough to kill germs. Maybe Viscose needs the same? Ive had many other crepes that didnt shrink after that first wash. I have noticed that my rayon challis, which I love for blouses, continues to shrink slowly. I usually dont get more than 2 years out if a rayon blouse. I would quit buying that too except I love it in blouses. Ps My closet is so stuffed that 2 years wear translates to about 12 wearings. Maybe Viscose needs the same? No, I don't think so. Rayon, viscose, cupro (basically all the same with different names) is a fiber that is really weak when it's wet. So you should put it in a net bag to wash, use a gentle spin cycle, hang to dry (flat or treat it gently), and try not to iron (or use low iron setting.) When dry, rayon is fine. But it needs some extra TLC when it's wet. Bessie, good to know. Similar to Bev and Kathryn, I especially love a rayon challis for blouses and tops. I typically hand wash them, but have been known to be lazy and throw them in the wash. Just bought a couple of yards of rayon challis from Fabric Mart destined for blouses, so your advice is timely. Bev, sorry to hear about your trial... it is lovely. CCL, is okay to enter a project that you already did prep work on? I have something that may be suitable, but I traced the pattern and made a muslin a while ago. I did not start the actual cutting of fashion fabric and sewing until this week. ETA: Great! It is not a Lempi Dress (something a bit simpler) but as I am a beginner there will be "new to me" elements. One I can think of is mitred corners. I'll have a practice of those today on some scrap fabric. Definitely! This would be no different than using a TNT pattern. Include a new technique (such as a new to you way of finishing seams, or making your own seam binding for the first time, perhaps a new way of attaching interfacing, pockets, or even if the fashion fabric is a type that you've never worked with before) and you are all set. Hope that helps! Oh Goodie! So glad you are joining us! Dragon Lady and Kathryn have been helping me sort out how we can do the photos and voting for the contests - so stand by for explanations on how that will work - but we're trying to keep it as close to how last year's SWAP ran as possible to keep it easy. Bev, I am sorry to hear the fabric didn't work. Interesting to hear about experiences with viscose -I like to use it and never had trouble with it, washing my blouses more than 12 times... Also with viscose jersey. A few years ago I only used those and they were washed alot, never shrinking. I wonder if its about type of washing machine or detergent? The cupro stuff is not allowed to be produced in Europe anymore because of environmental reasons. Like Morzel I use and wash viscose and viscose jersey all the time in the washing machine and after the initial pre-wash have never suffered any further shrinkage. I do wash it on the hand wash/wool setting on my washing machine though. It's such a shame that your blouse shrunk sdBev it's a very pretty print. Thanks guys. It is rare but that can still happen sometimes. I wonder if its about type of washing machine or detergent? The cupro stuff is not allowed to be produced in Europe anymore because of environmental reasons. Clarification: problems with washing (shrinking) are mostly due to the type of finish put on the fabric (rayon/viscose) type. Rayon was originally made to be solely dry cleaned. Manufacturing techniques improved and they got better finishes...so you now get better luck with washing. But if you want to be safe...hand wash, flat dry. (I throw rayon in the washer and dryer, but I don't expect it to last forever.) If your rayon/viscose isn't up to your satisfaction, it's most likely due to the finish...try a different brand, source. Cupro is no longer allowed to be manufactured in GERMANY. It's still made in Switzerland, where it was invented. Germany banned it for environmental factors, but also because it is expensive to produce there. Also worth noting is that Bemberg, lining fabric, is officially Cupro. Also worth noting is that all rayon/viscose is fairly nasty towards the environment. It's based on plant fibers, but tons of water and chemicals go into the production. This is interesting about "green fashion". In German, but maybe you can find an English version or use Google translate. No sewing on a dress yet. I spent the weekend cleaning up the sewing area (never ending process) and sorting my fabric and patterns into project bins. The wool is in a bin with a few pattern options percolating for now. I'll probably have a peek at it now and then, soon, this weekend I think, I'll make a decision and get started! Soundss like one of my sewing session except my cleaning was limited to straightening the fabric shelves. Okay... Thought I would post this here. It's November 15th....happy one month left to sew a dress for the competition! How is everyone doing with their planning, fitting, practicing and sewing? Thanks for the reminder, CCL! I'm going to be toiling this weekend and barring any major problems will be sewing between Dec. 4 and 15 so should be fine! Looking forward to it!! I'll be doing the same as Stephanie, firming up my choice of fabric and pattern this weekend. If I choose the wool, I'll definitely have to do up a muslin. Otherwise, I have the metamorphic all set to go, as I just made it this summer. Maybe I'll just make both! I am trying to decide between 2 fabrics. Will not use the pattern I "muslined". In the end, I didnt like how the collar drapes. Cowls can be very pretty. This was just some floppy fabric on my chest. Dont want to muslin another, so I will use my block. My pdf is taped together. Muslin this weekend. 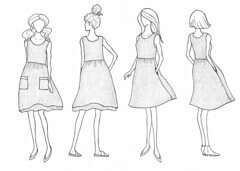 The pattern I'm using is very basic, once fitted it should be a straight forward sew. I'm contemplating how to add a little extra to make it more challenging. Hey gang, I've decided to use the wool for sure, but I have a question for you all. 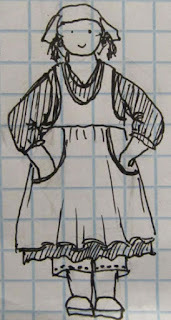 I originally planned to use the Metamorphic dress, which is sleeveless. But I really will have to wear a shirt beneath, cause a wool sleeveless dress seems a little ridiculous to me. So does this then make my dress a pinafore? And would it then not qualify as a dress? Because a wool pinafore is a lot less silly than a sleeveless wool dress. Sheesh. But I can completely see it in my minds eye with a turtleneck beneath, tights, and boots. LMK if you all think this would fit within the rules! It totally qualifies. 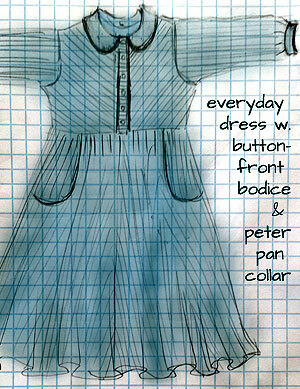 It's a popover dress, similar to those that IndigoTiger makes. I'm withdrawing from this challenge, it's not the best timing for me. I will be following along and cheering you all on. Oh, Becky, sorry to hear that and hope that it is not because of some family emergency. If everyone has fun with this and deem it a worthy enterprise maybe we can do it again next year and you will be able to join us then! Will miss seeing your creation this time around, though. Not a family emergency...Just a clothing crisis...I've lost just enough weight that I only have one pair of recently purchased jeans that fit me...I need to sew pants for the coming season. I will need a few dresses next year, one in June so will probably jump in on another dress thread when the time gets closer. I think this challenge is such a fantastic idea! I will be watching this thread for inspiration! Becky - we will miss your participation... yay for the losing weight, assuming it was intentional - but understand that sewing what our wardrobes actually need is the most important. I've finally gotten started on the dress. Top layer is cut, and I've sewn the gathering threads on the skirt. then DH needed the bedroom, so I had to stop sewing. I found 2 options for the lining, matching thread (plus some other goodies) at the fabric shop. Yay! Then realized I did not have my wallet. Boo! So I'll go back tomorrow to pick them up. I'll have to cut the lining, which is always a step I dread. Once that is done though the dress should come together quickly. The wool is VERY nice to handle. Very well behaved. It is also very purple. It may need something to give the eye some relief, but it is really intended to be layered, so right now I'm not too worried about it.